The Directory for Locating Soap Makers! The mission of the Natural Soap Directory™ is to encourage the production of handmade soap and to promote handmade soap to the general public by creating a hub for soap makers, by listing detailed information and photos from each soap maker, and by educating the public about the soap making craft through online advertisements, postcard mailings, and promotional stickers. These postcards are given to members and are sent out to the general public in mass mailings to promote handmade soap. Looking for the Perfect Gift? Everyone Uses Soap! …Don't You? The soap makers listed with the Natural Soap Directory each create a special soap by hand. Their handmade soaps reflect their ingenuity and their love of the soap making craft. Our "Cold Process" and "Hot Process" soap makers prepare real soap from scratch by carefully selecting wholesome base oils and magically saponify them into genuine soap. These exuberant soaps retain all of the natural glycerin from the base oils. Bathing with real soap is a luxurious experience that is unsurpassed. Treat your self—or a friend—to a bar of real cold or hot process handmade soap! Our "Melt and Pour" soap makers meticulously design miniature works of art that are fashioned from soap. They proudly present their soaps as an abundant assortment of colors, scents, textures, and designs from many different detailed molds. Enjoy giving a beautiful bar of melt and pour soap to a friend or treasure it for yourself! Promotional stickers are sent out to soap maker members. The soap makers use these stickers as seals on bags, boxes, invoices, receipts, and gifts to thank people for choosing handmade soap and to promote handmade soap. By choosing handcrafted soap, you support the dream of a soapmaker who loves the art of soapmaking and is listed with the Natural Soap Directory. The soap makers listed within this directory each craft a special soap by hand. These soap makers begin with carefully selected ingredients to create handmade natural soap. They offer their delightful soaps, the products of their labor and love, for sale. Their handmade natural soaps are perfect for daily bathing and make wonderful gifts that are treasured by all. Handmade natural soap is universally appreciated and considered a rare treat. The Natural Soap Directory™ lists soap makers by company name, by US state, and by country. The directory areas Find a Soap Maker by Company and Find a Soap Maker by State or Country aid conscientious shoppers in finding local soap makers, although many soap makers sell their beautiful soaps on the Internet and ship their soaps to any state or country. Find a soap maker who makes handmade natural soap in the Natural Soap Directory™! For those who make handmade natural soap, check the Supplies for Making Soap area for that long sought after ingredient, product, or tool for making soap. Soap supply companies are listed by company name. 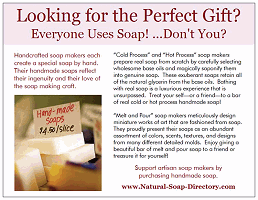 Find supplies for making soap in the Natural Soap Directory™! The directory listings provide detailed information about each soap maker and include the location of the soap store, the types of soaps sold, the average price of a bar of handmade soap from the store, the areas of soap specialty, the soap maker's years of experience, and a hyperlink to the soap company's website (if applicable). Soap makers interested in a directory listing should visit the Natural Soap Directory Listing area. Learn how soap is made! View the new Saponification Process diagrams to understand the chemical reaction that produces real natural soap.